Alexander Scriabin was a visionary Russian composer of the turn of the 20th century. His music encompasses a steep stylistic progression from his adolescent romantic Chopinesque yet highly individual works to the futuristic compositions of 1910s, standing at the forefront of the early 20th century avant-garde. During his meteoric rise Scriabin’s music evolved, absorbing Liszt’s innovative forms, adopting Wagner’s ideas of Gesamtkunstwerk, and embracing synesthesia, the association of sounds with colors (as in his groundbreaking orchestral tone poem Prometheus: the Poem of Fire), as well as spiritual mysticism. Scriabin’s projected Mysterium was to combine various types of arts and involve all human senses to transcend the humanity in a spiritual orgiastic final act. His philosophy was strongly influenced by the ideas of Theosophy. Moscow-born American pianist Dmitry Rachmanov was exposed to Scriabin’s music as a student of the Gnessin Special Music School in Moscow. A founding member of the Scriabin Society of America, he has given lectures and classes on the composer and has recorded two albums of his works. 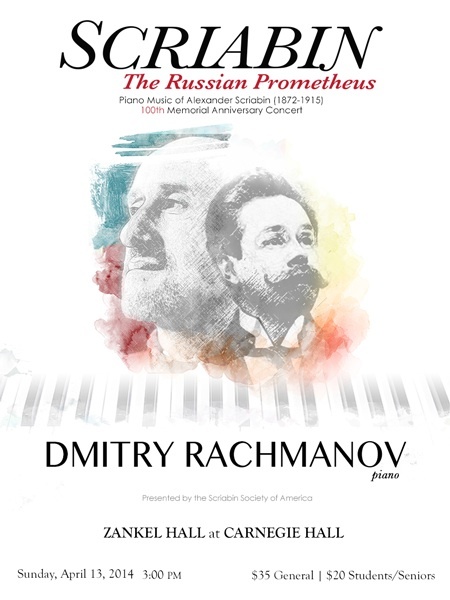 In this concert, Dmitry Rachmanov offers an all-Scriabin piano solo program, which presents a survey of the composer’s stylistic and spiritual development over nearly three decades. He plans to take this program on a worldwide tour starting in 2014.